June 2010 – CREATE. PLAY. TRANSFORM. People talk about a lot of things. Over a hundred ways to speak it, over a thousand decisions to make – whether to listen or not, and over a million subjects to share. One of the million things that has caught my attention, is working with clay and how to play with fire. For almost eight years now, I am still hooked to watching people form clay, and observe how a kiln reacts with fire. Last night, I attended a gathering of Philippine Potters. Some of them shared their experiences, from their recent pottery trips abroad and kiln building techniques. I saw the fire in their eyes as they talk about their passion. Inner fire or a great passion for something keeps a person going. 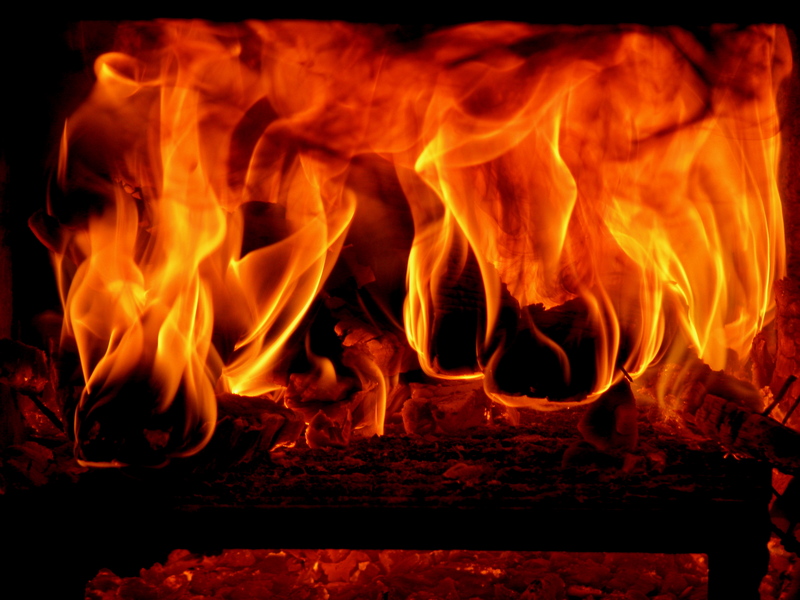 But seeing flames and feeling the heat of a roaring kiln makes me tremble. It never fails everytime I fire my kiln, or the kiln in the University, where I assist every now and then. As I gather wood, and as I stoke, excitement fills my bones. It somehow brings back the fire that was once lost in me: To keep living. Fire encourages me in so many ways. As the temperature rises, I look forward to opening the kiln the next day, after it has cooled down. And yes, I love the smell of a freshly fired kiln. Opening it brick by brick, still feeling its warmth. Sometimes I forget to wear protective gloves, and not caring at all if the dirt, or marks of fire that seeped through the peep holes have stained my hands and clothes. Some say it’s a man’s job to be a potter. It’s never about gender. It’s about the fire that burns inside. What burns in me is encouragement. Not task, not just the craft or art of pottery making. It’s how the clay ministers to me, and how the fire communicates with me. Fire is hot. Fire hurts. It can kill and destroy. But it also gives birth to beautiful creations. Inner and outer beauty. If only pots could talk, it could have been a hellish scene being inside the fiery furnace. But could it possibly be the opposite? A pottery studio sits in a backyard of a home in Quezon City. Bone-dry pieces of clay can turn to dust very quickly, so I do my daily cleaning as I wait for my student to come. I look at the ceiling and notice that it needs some repair. The rainy season is finally here, and I’m glad that I had my roofing done before summer, way before summer. As I look around and feel satisfied with my cleaning skills for the day, the doorbell rang. I put my sweeping materials away and headed to the door. I welcomed my student with a smile, and she came in excited. “Mia! I want to work on the potter’s wheel today!” Seeing students get excited to work with clay, is one of the beautiful things that I cherish. It’s going to be her first time to spin the wheel, so I am very excited for her too. I will never forget my first time to get dirty with clay. It was the most surreal encounter. No wonder I’m still into it. The excitement in the studio is overwhelming, and the next thing I know, my student is sitting on the kick wheel. She was wearing all white with her four-inch wedge sandals. Sounds like a bad idea for a pottery making day, but she pulled it off pretty well. Clay splatter on her white shirt and pair of shorts, but she didn’t care at all. The sound of her kicking wedge sandals fills the studio. She was so focused to learn the skill, and seeing her clothes get dirty is the last thing thing to be worried about. 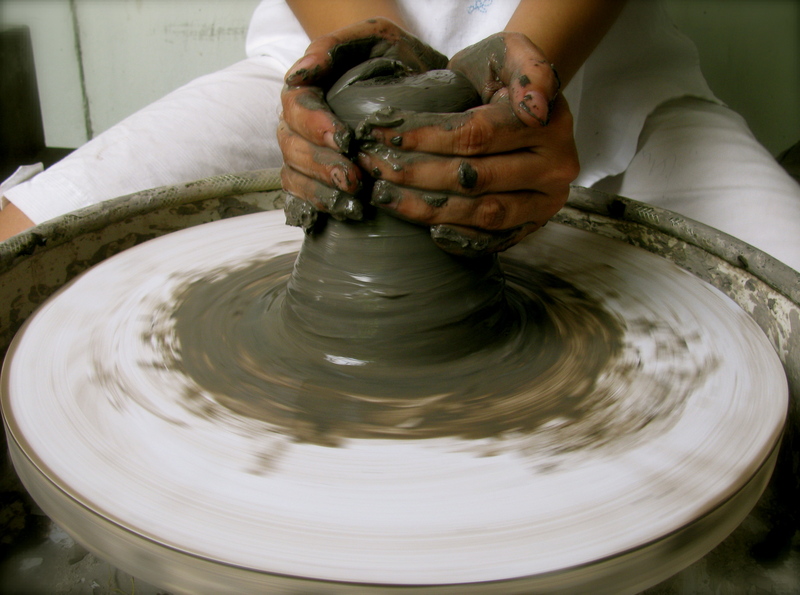 Centering clay is important to achieve in forming pots. She brings this lump of clay up and down, until the clay doesn’t wobble anymore. Speed is key. 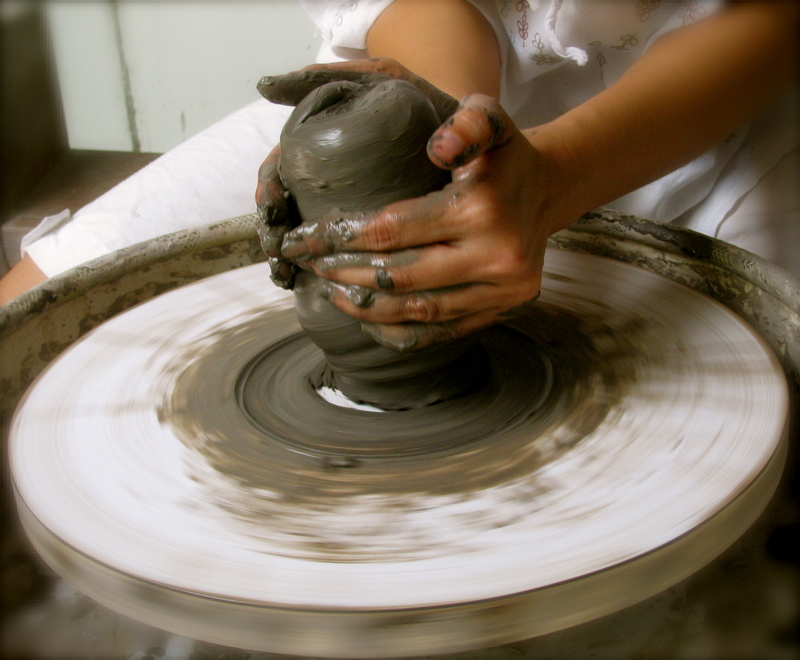 To be able to stop the wobbling, the potter needs to be centered too. Elbows on the lap helps a lot. One can get very excited to mold clay between his/her hands. This baby is about to be taken off the bat. I looked at my student and didn’t stop her from pressing the clay too strong. I allow her to experience what is about to happen, when too much pressure is applied on the clay. Several things could happen: the clay will wobble, it can get detached from the bat, etc. As soon as she learned her lesson, the second time around becomes easier to manage. There are several ways to pull a clay up, but my students are free to discover their most comfortable hand position. The joy in seeing them form a lump of clay to life is irreplaceable. After several attempts to center, open up, and lift the walls up of the clay, my student starts to feel comfortable. And as a teacher, I know that I did my job well, once I see their hands, shoulders, and face relaxed. No tension, only satisfaction. 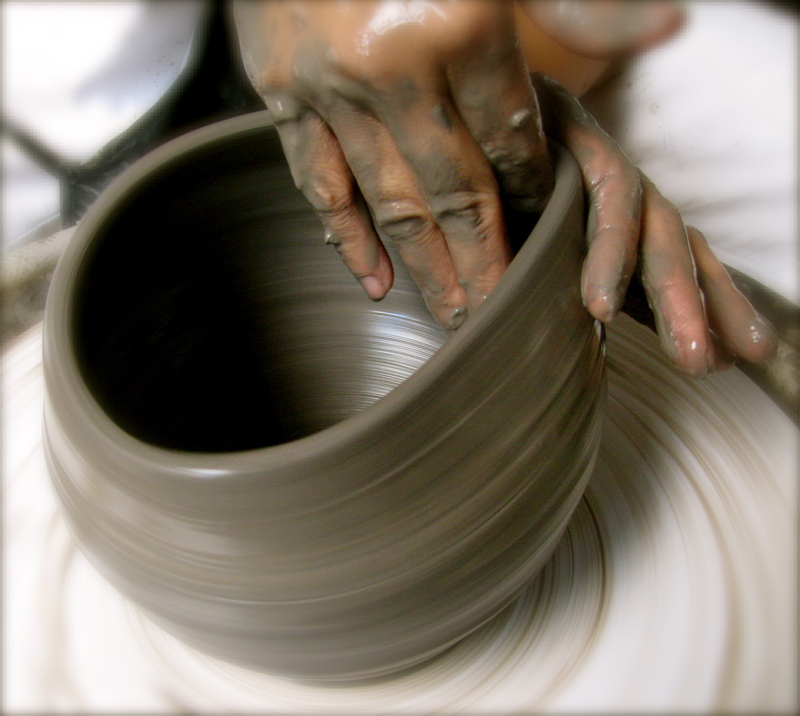 Years ago, I learned how to center clay with my eyes closed, or by looking away from the spinning clay. It can really get intimidating in the beginning, but once you know that the potter takes control, any type of tension will be put aside. My student washes her hands after her first experience on the potter’s wheel. A little tired but she was all smiles.